How do you know if you need a new roof or just a repair? Here are some tips to help you answer that question. If you are concerned about the quality of your roof, spring is the best to do check because winter damage is fresh and easier to see. Asphalt roof homeowners should look for thin, weather-worn shingles. 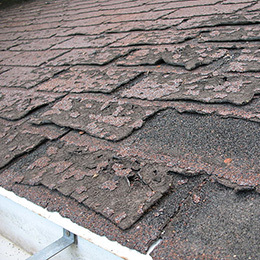 Old asphalt shingles loose their heavy oils and become dry and brittle. If possible, try to feel the roof to check for dry or brittle shingles. Asphalt shingles tend to lose their protective inner oils over time. Eventually the loss of the heavy oils causes the fibers to shrink, exposing the nail heads under the shingle flaps. Once the nail heads are exposed, water can seep into the nail holes around the nail shank, resulting in the rotting of the sub-roofing and cause moisture damage all the way down to the ceilings. Homeowners with Wooden Shakes and Shingles should be on the lookout for very dry, cracked or warped shingles. 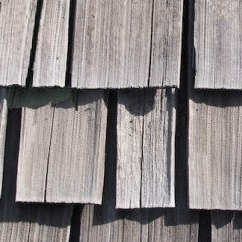 Wooden shake shingles will dry out and split. Look for a sag in the roofline. Look closely at the roof line to see if it is perfectly horizontal. If you notice a sag, call Bay Area Re-Roofing at 650-593-0116 immediately. It is possible that you may have a structural problem as a result of a prolonged roof leak. Be sure to inspect your attic for water stains, as damage is not always visible from the outside. Check for water stains in the rafters, sheathing, and insulation. Light passing into the attic may also be a sign of water damage. After completing an initial check on your roof, call Bay Area Re-Roofing for a complete and thorough free estimate, or fill out and submit our Estimate Request Form here. Bay Area Re-Roofing services homeowners from Palo Alto to South San Francisco.